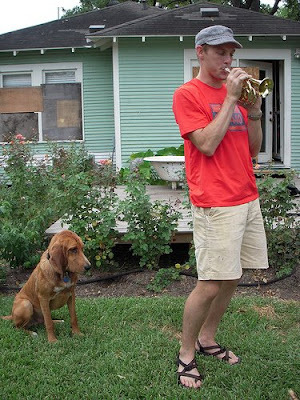 I'm in New York to work with new teachers, and it's so difficult to be away from home (Houston) as my partner, Matt, and dog, Hoss, are left to weather Hurricane Ike and its aftermath. I was originally scheduled to leave on Friday morning, but Matt convinced me to reschedule my flight for Thursday to ensure a smooth departure. As the storm moved toward Houston, Matt and Hoss decided to stay with our friends, Camella and Kevin, because they had boarded up their windows. They had four adults and four animals packed in their two-bedroom, one-bedroom house. In the middle of the night, a tree crashed down on the house. Everyone was okay, but they had to flee to the neighbor's house through the stormy conditions. Matt had to carry our 70-pound dog through the standing water. I can't even begin to imagine how scared he must have been. When things calmed down, he walked through our neighborhood. We were very, very lucky. A big tree fell down in our backyard and took out the electrical wires, and our doors may be a little cracked and damaged, which may indicate some foundation shifting/damage, but that's it. Our neighborhood seems to be in bad shape, though. Apparently, lots of trees have fallen on houses. I'm not sure how to get home or what we'll do once I actually get there. The airport is currently closed. I'm scheduled to fly out Monday morning at 6:30, but I'm just not sure. Continental isn't being straightforward about which flights are canceled/delayed; they are still showing that all of their flights are on for today, even though the airport is closed. Even if I do make it back to Houston, I'm not sure if the highways are going to be too flooded or too congested to get home. We're not yet sure when power will be restored or when Matt is required to return to work. When life challenges us, I promise to focus on the resiliency of our love. So glad everyone is safe, and I hope you get to go home soon! Wow, hurricanes are tramatic things to experience! I'm so glad that you & your family is safe & ok. The house can always be taken care of, the people are the biggest concern. I'll keep you and yours in my thoughts. Glad the house came out alright.